For 10 years, Youth Ensemble Theater has worked with groups of intergenerational adults, youths, and children to create ensemble theater, using its own approach to theater production and social awareness strategies. The goal has always been to create non-competitive forums to create high quality theater events and cultivate group responsibility. Our plays have performed in professional and community venues, in the Hudson Valley and New York City including: Off-Broadway at the 52nd Street Project and the Labyrinth Theater company’s Bank Street Theater, The Richard B. Fisher Performing Arts Center, NY State & Film/Powerhouse Theater Festival, Boughton Place, Byrdcliffe Theater, and High Meadow Performing Arts Center. The Youth Ensemble Theater is a pre-professional theater company in Ulster County dedicated to producing original performance pieces by emerging youth actors. Directed by Amy Poux, the program uses a Collaborative Ensemble Theater approach based upon the work of Augusto Boal, Bertolt Brecht and the Group Theater. Working with students from ages 9 to 18, young people learn the fundamentals of acting for the stage, while playing close to the edge in their art form. There are three sections of Youth Ensemble Theater. YET has a school year program as well as a Summer Institute. Collaborative Ensemble Theater is a form of theater that originates with the members of the group. Improvisational acting techniques, collaborative story making, brainstorming, group-building, character development, and acting technique exercises, are all part of the training used to create ensemble work. All of it is based on the concept that theater is not an elitist art form but for everyone, and should represent diverse points of view rather than further a bourgeois agenda. Ensemble Theater is a forum to represent under-represented peoples and to incite awareness and action. Sometimes referred to as “Devised Theater”, Ensemble Theater stands on the shoulders of a rich tradition in theater and performance. 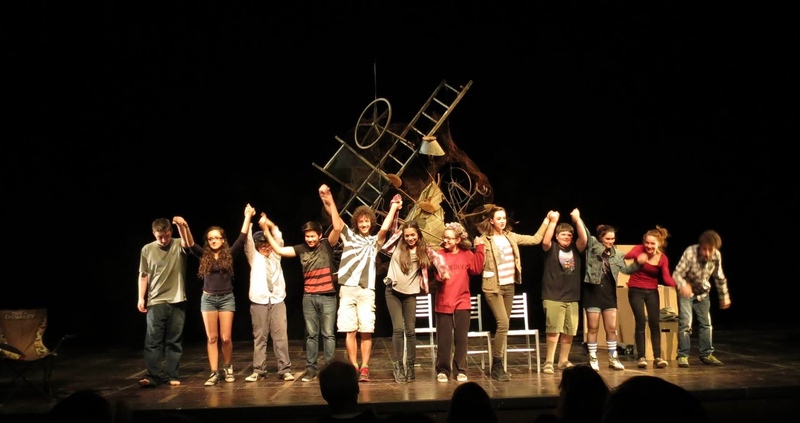 It is based on the principals of Theatre of the Oppressed, which Augusto Boal founded and fostered with his theatre troupe in Brazil in the 1960’s. Boal’s primary inspiration was Bertolt Brecht’s Epic Theatre work, which originated in the 1930’s in response to Nazi Germany. The performance styles of Ensemble Theater have a wide range from experimental to linear but are typically made through a collaborative process, and provide actors with similar sized roles. This is different than traditional theatrical plays, which usually have two or three lead roles and many smaller parts. Ensemble Theater usually uses minimal/representative sets and costumes. The performance spaces tend to be in-the-round or in smaller more intimate spaces, so that ticket price (i.e. economic status) does not dictate exclusive rights to a superior theater experience for the audience member. Collaborative Ensemble Theater is not used in the typical school setting. Scores of young people are leaving their adolescence with a superficial understanding of their own abilities and worth as performers because they are judged on a scale that includes: lead roles and small roles, following directions from a director who adheres to an audition process, and by enlarge, doing plays that are mostly musicals written long before they were born. Middle and high school could be the place for young people to explore their divergent ideas through performance, rather than confirm their worst self-concepts through auditions. How can we audition people who have not even been properly trained to act? How can we put young people in a rehearsal process where they are following directions and aiming toward a result without giving them support for an artistic process of discovery? We would never ask a young person to perform a music piece without training and technique in that musical instrument. Yet, we expect them to perform theater without training in their own instrument (themselves) as actors. This oppressive process puts emerging minds on a journey of self-doubt, self-consciousness, and competition rather than exploration, self-empowerment and individual challenge. Based on Amy Poux’s 20+ years of doing original theater with young people, YOUTH ENSEMBLE THEATER aims to provide another artistic path for young people.